You may as well throw your iPhone into the glacier on your way in: there’s no internet or mobile coverage whatsoever at this remote Alaskan hotel in the middle of a glacier. What there is instead, in abundance, is what the Sheldon family call “comfortable luxury” within “the wildness of Alaska.” The two-storey Sheldon Chalet is 6,000 feet in elevation, and positioned on a nunatak: an exposed piece of rock that’s covered by snow, in the middle of the mountains, in absolute isolation. The Sheldon Chalet is the result of a dream. The dream of Don and Roberta Sheldon, who in the mid part of last Century questioned whether this unimaginable abyss could ever be inhabited. Three generations later and the hotel is due to open next month, in February 2018. Boasting comfort, warmth and luxury where it was thought to be impossible, the stunning property features a light wooden exterior influenced by the ski chalets of mountainous towns, plenty of generous windows and doors to allow the natural light in, and a traditional Alpine feel interior. 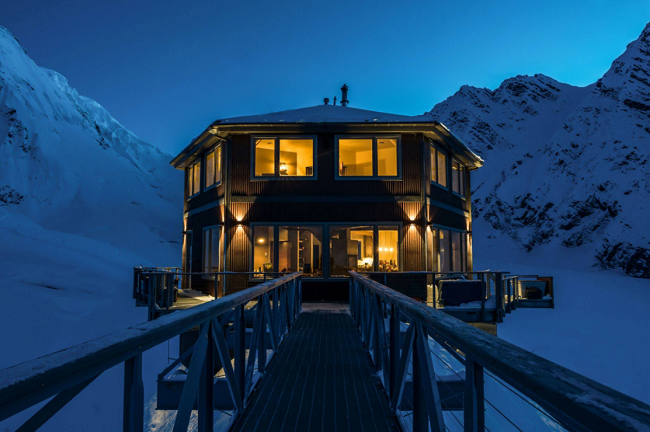 The hotel – which is now taking bookings – is positioned only 10 miles from the summit of the mountain of Denali, North America’s highest mountain. The chalet has five bedrooms, which can accommodate up to ten guests, and can be prepared into single or double beds, depending on occupancy. The Sheldon Chalet is available privately, or to share with other guests, depending on the size of your party. Taken at surface value, the experience seems to be all about staying in – but the natural landscape nearby is thrillingly untouched. Adventurous souls can go igloo building, night trekking, sledding and crevasse exploring in the local area, where herbs are foraged and served with seafood and Champagne (and other seasonal dishes) by staff back at the chalet. Or, discover untouched hot springs and hike along a ridgeline with a unique perspective and unmatched views of Mount Denali. The nunatak was the stomping grounds of eponymous ‘bush pilot’ Don Sheldon, and his mapper and explorer confidante Brad Washburn, who spent time here in the middle of last Century, mapping the Alaska Range area. In his lifetime Don pioneered glacier landings, in and around the Denali area.